By the time the two travelers had exited the city proper, clouds had begun to form, casting the surrounding plains in a cool, blanketing shade. They stood at the foot of the mountains, dwarfed in the height of the craggly peaks. Most of the side was covered in thick brush and trees, though where they stood, a vague path winded up and disappeared into the overgrowth. If one followed the direction of the trail with their eyes, they just might catch a thin plume of white smoke drifting into the sky. Seanfear waved a hand at the peak. "Almost there," he assured his new companion. "Just a hop and a skip up the side, and we're home." I ask this of you for your favor I've been earning." Suddenly, Josef was surrounded by a translucent green veil. The muscles in his legs seemed to bolster. He straightened up, stretching his legs as the veil faded. Sighing happily, he turned to Seanfear, who was looking on in disbelief. "A young whippersnapper like you really needs magic to climb, eh?" he grumbled, shaking his head. "People these days." Taking a deep breath, the old druid tackled the slope, beginning a rhythmic ascent that seemed unbelievably sprightly for his apparent age. With newfound strength, the young bard jogged up to the druid before slowing down so they could walk together. Although it seemed like a far journey, he didn't mind. Seanfear may seem a bit rough around the edges, but Josef could tell he was a good person. His blond curls bobbed with each stride, the feather on his cap mimicking the motion almost exactly. With every step, the bells on his shoes made a pleasing jingle. Despite his appearance, Seanfear tackled the climb with a sage-like ease. He must have walked this path many times over the course of his life. The rest of the trek, at least in Seanfear's case, passed in silence. The old man supposed a lack of speaking would give a mystic vibe. In truth, he didn't want to risk showing how badly he was panting. By the time they reached the top, his lungs felt inflamed, and he found himself envious of the youth's spell. "This be it," he muttered simply, unable at the moment to say much more. 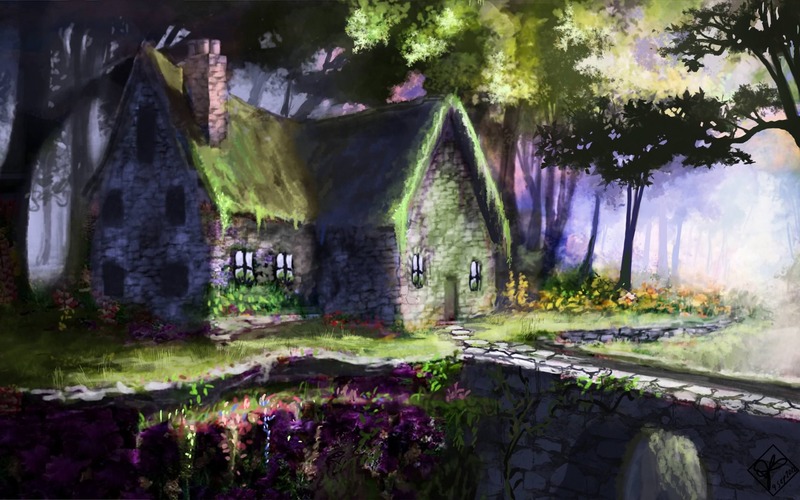 It was a simple cottage, walls and ceiling blanketed in a thick layer of moss, with a joyful gulch stream gurgling happily down the mountaintop. Light tufts of smoke drifted up from the chimney, mingling with the swaying tops of sycamores and oaks. Seanfear crossed the bridge, turning to face his compatriot with a triumphant, sloppy grin.